I can’t believe I never heard of Manuele Fior before. 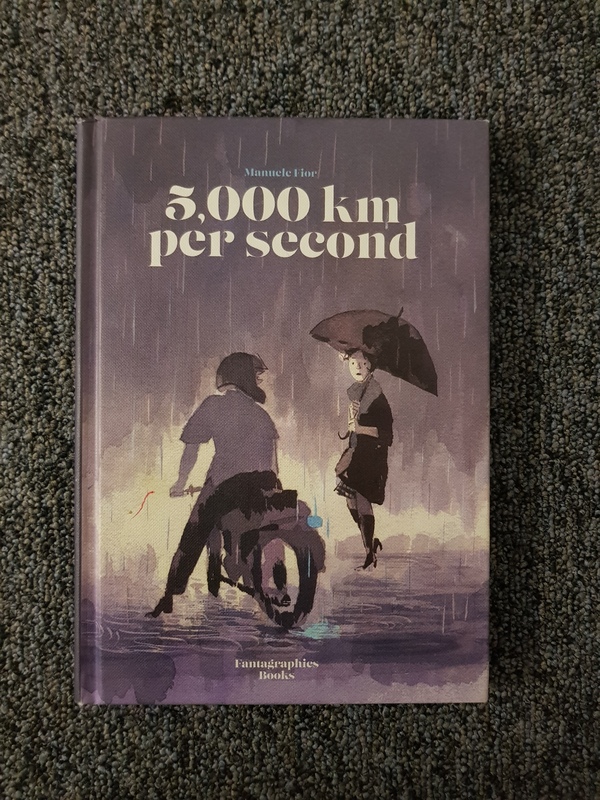 5,000 km per Second is an extraordinary book – succeeding on all levels: as story, as a set of characterizations and as a graphic narrative. In fact, the art is to me the most astonishing aspect of it. I think we sometimes make allowances for comic books, for the limitations in the way comic books carry a narrative visually. I’ve never read a book like Fior’s, with it’s extraordinary approach to exactness. I kept going back and forth in the book, admiring his work. Until, that is, the end of the book, when the sad music of the book’s song of love and loss comes to a beautiful elegiac end and I needed a break. This is an absolutely gorgeous book, with only the sometimes angular dialog as an occasional weakness. 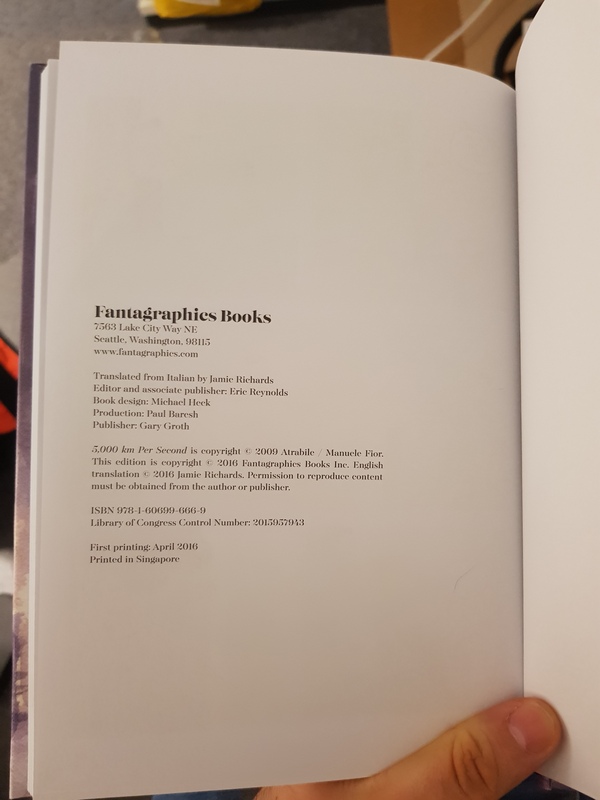 Fior is Italian and the book was translated into English for Fantagraphics, not that the publisher is particularly forthcoming with this information. Ir’s not until the final page of the book that we find, in small print, the name of the translator, a man called Jamie Richards, who translated the novel, originally called Cinquemila chilometri al secondo, into this English that’s less than ideal. My Italian isn’t good enough to figure out whether a sentence is aesthetically pleasing so I cannot compare, but there’s a kind of awkwardness that I tend to associate with translations. That said, whatever misgivings I might have regarding the dialog, it’s never a very important element. Fior’s skill as an artist is such that for much of the book, we would understand the story even without any dialog. If you read only one comic book this year, make it this one. The story isn’t written as memory – it is an interrupted love story that stretches over a long period of time, told in the moment rather than as something remembered, but at the same time, Fior captures the complexities of memory with a rare skill, singling out moments, situations, gestures in a way that invites all of us who have had broken hearts, unfulfilled longings, tragic amorous histories to share in this story. And while the basic structure of the story isn’t remembrance, memory, and the stories we tell each other about our past, all these still play a central role in the book. The episodes are connected by the two protagonist remembering earlier episodes, remembering each other, creating a sense of what could have been rather than an anticipation of the future. Every new episode, every jump ahead into the future represents a significant change in the life of the protagonists, but the book doesn’t, I think expect us to anticipate these developments. Instead, every episode is a layered composite of all the previous ones, and represents one path taken of many that could have been – and there’s a tragic, melancholic sense of loss in this. The loss of all the other possible futures, that is. If you’ve ever looked at the path your life took and wonder where things shifted, went wrong (or well) to lead you to where you are today, you have a sense of how the book works. There’s no “glo up” in the book – at best there’s a feeling, in the end, of some tired acceptance of everything that has happened. Things never go entirely well, hopes dissolve, futures turn cloudy and unhappy. Have you ever looked at the evening sky and wondered where the day, the week, the month, your life has gone? Much of this is communicated by Fior’s book. 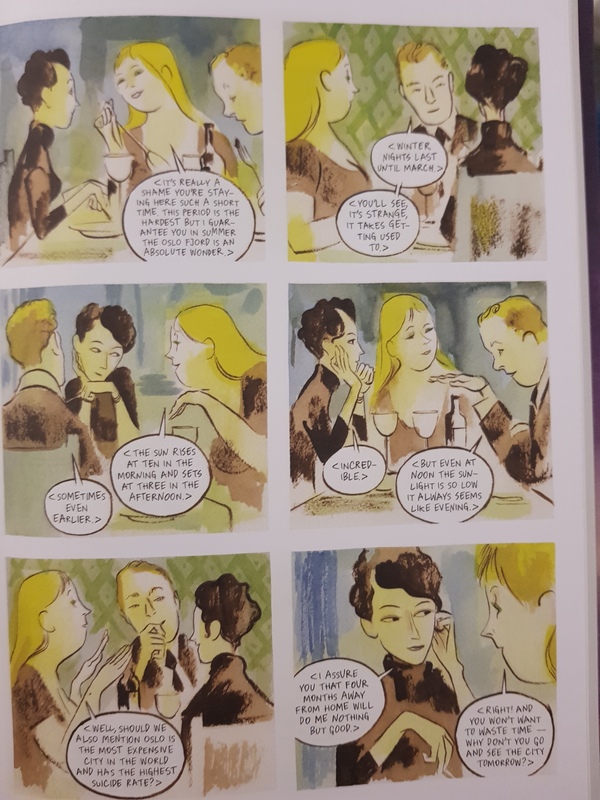 We meet Pietro and Lucia as young Italian teenagers, and then find them again and again, until we are offered, towards the end, a completely dispiriting hasty attempt at sexual congress between two sad, bloated middle aged versions of their younger self. Lucia tells Pietro not to look at her, out of a shame that must have grown in her in years and years of bad experiences and shame, very little of which is shown in previous episodes. When he fails to rise to the occasion, she blames it on his having looked at her. This is the saddest scene I have read in any book, in any genre this year, and I’ve read some very unhappy literature. It’s important to understand that when we remember episodes of the past, they are not a complete, or even largely complete guide to who we are today, how we ended up as the people we are today. Fior understands this, and he doesn’t use the episodes as full explanations for how the characters end up where they are – partially, sure, but middle aged Lucia’s shame and embarrassment’s source is hinted at in one episode, but fundamentally, we are presented with the way she is, and are asked to fill in the sad, but inescapable facts of her life. Every moment of our lives we have a choice – a choice of where to go, what to do, who or what to pursue. At the same time, we are already locked into our moment by our past choices. What’s truly remarkable about Pietro and Lucia’s story is not the deflating trajectory it takes, but the almost miraculous way their paths keep crossing, the opportunities that keep accruing, the way each failure is followed by another opportunity. It’s tempting to see the book as a kind of love story, but really, it’s about the way adulthood is often a mixture of compromises, disappointments and small hard won successes. The recurring tale of Pietro and Lucia just serves to show that what the two follow is indeed a path and not a random selection of episodes. The way they change, not just as individuals, but also how they change as friends, lovers and acquaintances shows the winding path to sexual inadequacy, loneliness and the small compromises many of us take to evade. 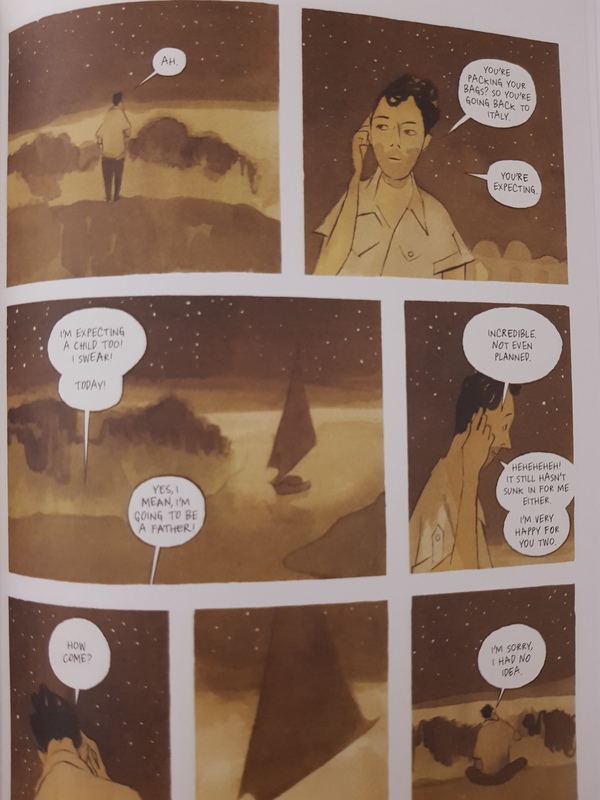 Manuele Fior’s success as a storyteller is almost impossible to overstate. Structurally, this easily keeps up with some of the best short novels I’ve recently read. I say short novels – to be clear, this text depends on being a rather short book. Blown up to the proportions of the unbearably unbearable One Day by whatshisname it would lose almost all of its appeal. All the episodes are brief, showing short moments. A meeting over coffee, am unpleasant morning in the car, a nighttime arrival in Norway and and a midnight romance. Even the one episode that strictly speaking takes place over a longer period, is told succinctly and efficiently. Whatever the comic’s page count, this is, structurally, a novella kind of story. To be clear – I am not trying to say that this book could have been prose. It was just to situate it among the other books I read this year. No, Fior’s greatest strength is his unbelievable skill as an artist. I have never read a comic where the artist had such a sure, such an exact sense of what counts in a given panel. No character or setting is ever completely drawn, much of it is full of the vague clouds of Fior’s watercolors – but Fior is incredibly good at concentrating on one gesture, one facial quirk, one interaction. Sometimes this can be the whole shape and movement of a pregnant woman in a tub, sometimes it’s just a hand holding a chin, or a hand reaching out, or a face that can’t believe what it’s hearing. This is true for every single panel – and in every single panel, the sometimes vague, sometimes expressionistic elements serve to underline the importance of the one exact, relevant gesture. The combination of evocative, inexact vibrancy and the sharpness of small elements makes the memory/immediacy double structure of the story told work so well. 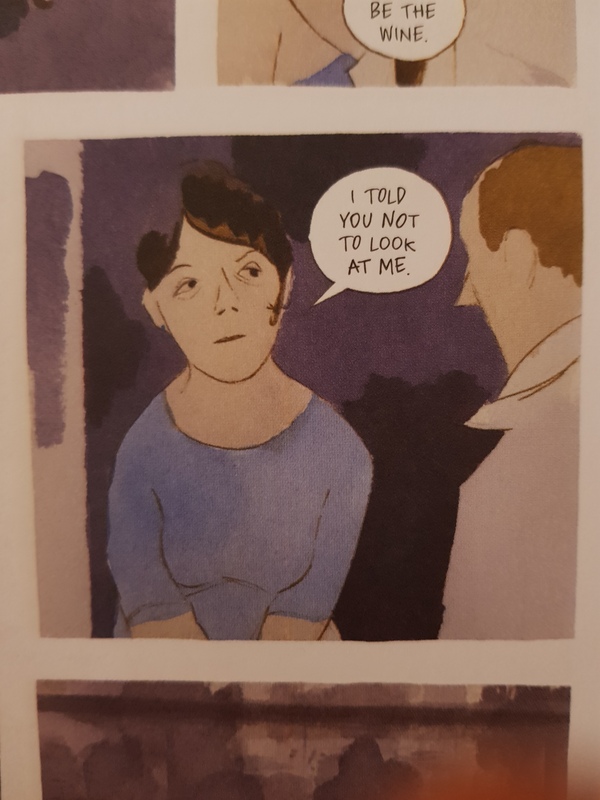 It also contributes to our reading of the story as efficient and sharp rather than maudlin, no small feat given the sometimes overwhelming feeling of melancholy that the story is dipped in. Manuele Fior offers us a novel about life as a series of repetitions of diminishing returns, of the stupidity of hope, and the sadness of middle age, and the betrayal of the heavy bear that walks with us, our bodies, and yet when we finish it we are elated, and left with admiration, and that strange feeling of happiness that always accompanies the reading of a true masterpiece. Or maybe that’s just me.